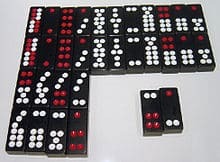 Chinese dominoes are used in several tile-based games, namely, Tien Gow, Pai Gow, Tiu U and Kap Tai Shap. In Cantonese they are called "Gwat Pai" (骨牌), which literally means "bone tiles"; it is also the name of a northern Chinese game, where the rules are quite different from the southern Chinese game Tien Gow. References to Chinese domino tiles can be traced to writings from the Song Dynasty (AD 1120). Each tile pattern in the Chinese domino set is made up of the outcome of a throw of two six-sided dice. Each combination is only used once, so there are 21 unique possible patterns. Eleven of these 21 unique patterns are repeated to make a total of 32 tiles in a Chinese dominoes set. The tile set consists of 32 tiles in two "suits" or groups called "military" and "civilian". The civilian suit was originally called the "Chinese" suit and the military suit was called the "barbarian" suit but was changed during the Qing dynasty (1644-1912) to avoid offending the ruling Manchus. There are no markings on the tiles to distinguish these suits; a player must simply remember which tiles belong to which group. The tile set contains two each of eleven civilian suit tiles (6-6, 1-1, 4-4, 1-3, 5-5, 3-3, 2-2, 5-6, 4-6, 1-6, 1-5) and one each of ten military suit tiles (3-6, 4-5; 2-6, 3-5; 2-5, 3-4; 2-4; 1-4, 2-3; 1-2). Each civilian tile also has a Chinese name (and common rough translation to English): The 6-6 is tin (天 heaven), 1-1 is dei (地 earth), 4-4 is yan (人 man), 1-3 is ngo (鵝 goose or 和 harmony), 5-5 is mui (梅 plum flower), 3-3 is cheung (長 long), 2-2 is ban (板 board), 5-6 is fu (斧 hatchet), 4-6 is ping (屏 partition), 1-6 is tsat (七) (long leg seven), and 1-5 is luk (六) (big head six). The civilian tiles are ranked according to the Chinese cultural significance of the tile names, and must be memorized. For example, heaven ranks higher than earth; earth ranks higher than man etc. Remembering the suits and rankings of the tiles is easier if one understands the Chinese names of the tiles and the symbolism behind them. The military tiles are named and ranked according to the total points on the tiles. For example, the "nines" (3-6 and 4-5) rank higher than the "eights" (2-6 and 3-5). The military tiles (since there is only one each) are also considered to be five mixed "pairs" (for example, the 3-6 and 4-5 tiles "match" because they have same total points and both in the military suit). Among the military tiles, individual tiles of the same pair (such as 1-4 and 2-3) rank equally. The 2-4 and 1-2 are an odd pair. They are the only tiles in the whole set that don't match other tiles in the normal sense. This pair when played together is considered a suit on its own, called the Gee Joon (至尊 Supreme). It is the highest ranking pair in the game of Pai Gow, though the tiles rank low individually (in their normal order). When a tile of this pair is played individually in the game of Tien Gow, each takes its regular ranking among other military suit tiles according to the total points. The rankings of the individual tiles are similar in most games. However, the ranking of combination tiles is slightly different in Pai Gow and Tien Gow. Using the same coloring scheme of the traditional Chinese dice, every half-domino with 1 or 4 spots has those spots colored red (for example, the 4-5 domino has four red spots and five white spots). The only exception is the pair of 6-6 tiles. Half of the spots on the 6-6 domino are colored red to make them stand out as the top ranking tiles. Tiles with blank ends, like those found in western "double-six" dominoes, once existed during the 17th-century. These games employed two sets of "double-six" tiles.